As I’m writing this I’m 15 weeks into my third pregnancy (fourth child :)), and *hallelujah! that means I’m officially into my second trimester. I’m still feeling pretty exhausted, and I’ve had the worst heartburn this past week but a lot of the first trimester symptoms have started to go away. Yay! Although honestly I attribute the exhaustion partly to being pregnant, but also just to having three young kiddos that are all in really hard phases. Kit, my four year old, is in a really bad sleep regression and Ella and Rosie, my twin two year olds, are… finding their voices? Ha! In all seriousness though, it’s been really hard. I’m completely beat and emotionally drained at the end of each day. A newborn is going to feel so easy compared to navigating the big emotions of toddlers and preschoolers. But anyway! Back to the first trimester. I really am SO thankful to be leaving it behind. I’m just not someone that enjoys being pregnant, and I always feel so miserable during the first trimester. I gave a pretty detailed update about my symptoms in this post so I won’t wax on too long, but basically my symptoms were: exhaustion, extreme food aversions, and just an overall feeling of being under the weather. Thankfully I didn’t have a ton of morning sickness, but it did come in waves here and there. My nose is already pretty sensitive, and those first few months it was almost unbearable for me at times. 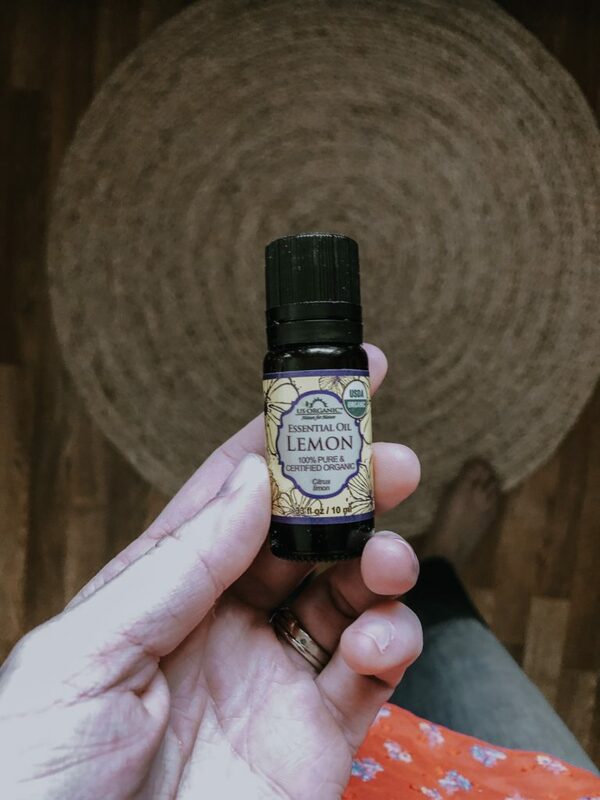 Taking a little sniff of lemon scent definitely helped a ton. Whenever I would feel super overwhelmed with something I would just pull this out of my pocket for a little sniff and it took the edge off. Another essential oil product that helped was this lavender calming mist. There where some stretches where I had the worst insomnia, which is so frustrating because the less sleep I got, the more intense my symptoms. 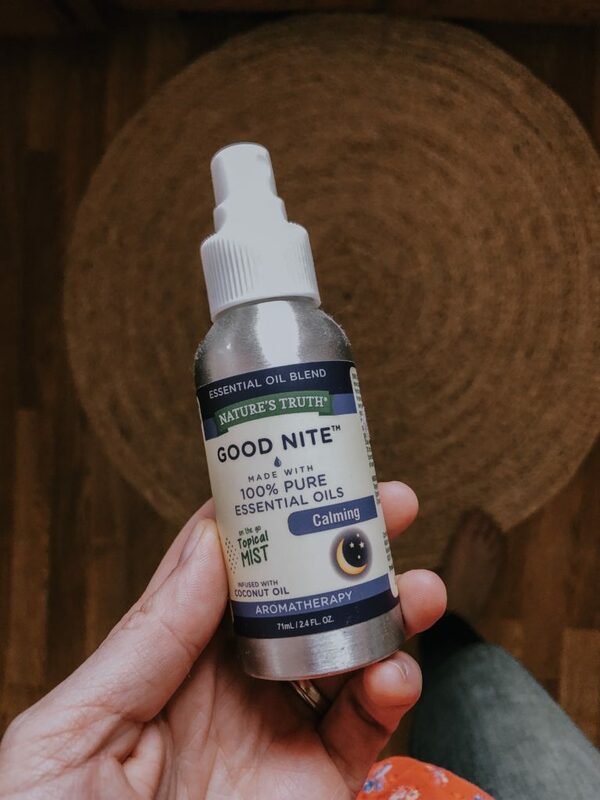 This didn’t help me to get a full night sleep, but it did help relax me so I was able to fall asleep a little more quickly (I use this with the girls sometimes too). With all three of my pregnancies I’ve gone through a period where my stomach itches unbearably. Obviously it’s the skin stretching as things grow, but the only way to make it feel better is to slather on a good moisturizer. I’ve used this one with all three pregnancies (I bathed myself in it when I was pregnant with the twins ha! ), and it’s the best one I’ve tried. It’s really affordable, made of good ingredients, and doesn’t have a strong scent. I actually use it when I’m not pregnant as well! These vitamins are actually a big deal for me! For the longest time I didn’t think I could take prenatal vitamins (or multivitamins) because I would get really intense headaches from them. With both of my previous pregnancies I took individual (necessary) vitamins and then tried to eat as healthy as possible. 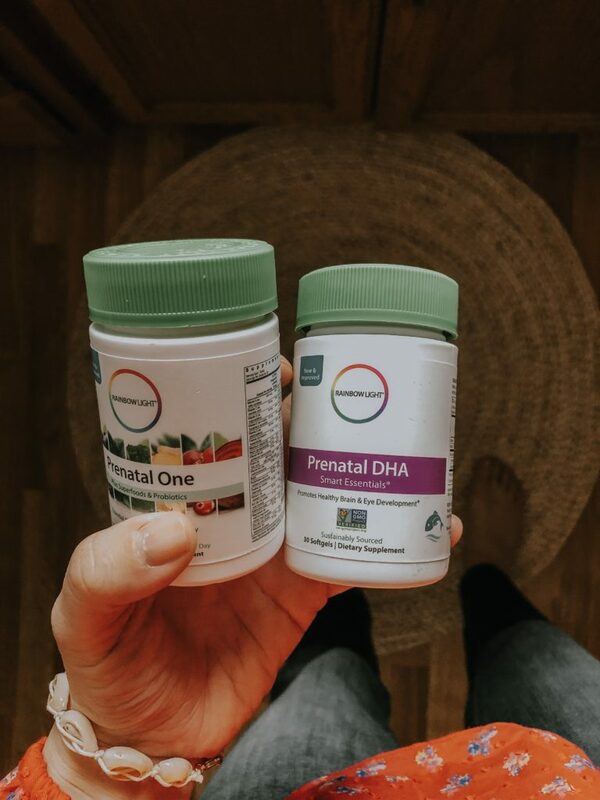 But as soon as I found out I was pregnant again I started doing a little research, and I was shocked to find out that a lot of prenatal vitamin brands include dairy, and a lot of other common allergens, in their ingredient list. Mystery solved! For those that don’t know, I cut out dairy about two years ago when I realized it was giving my the daily headaches I had suffered from for most of my life. From my research I discovered that the brand Rainbow Light is one of the few, easily accessible, brands that make an allergen free prenatal and I’ve had zero issues with them! They taste pretty terrible (I’m assuming it’s due to the lack of “extra” stuff), but it’s worth it in my opinion. This looks really funny, but it actually really came in handy! 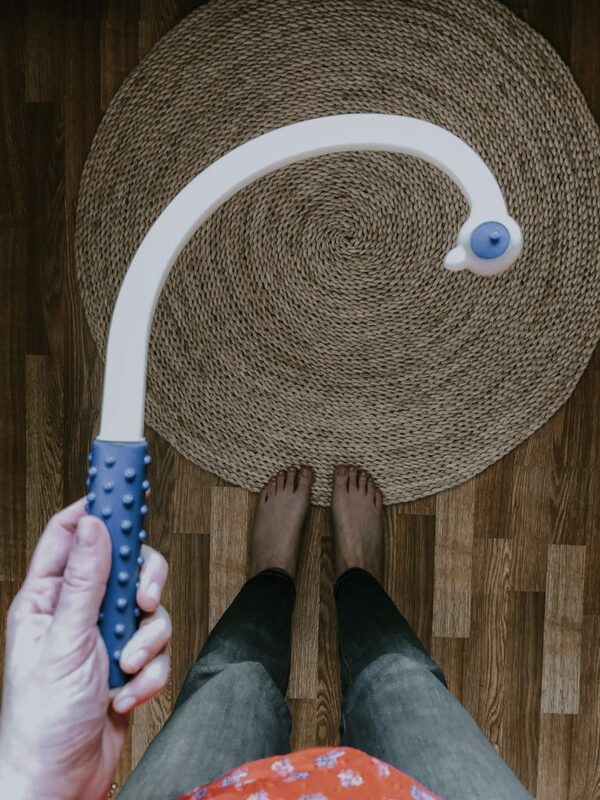 It’s a back massager stick. 🙂 I was laying around a lot more than I’m used to so my lower back and shoulders where really tight. While it would be the best thing ever to have a personal masseuse that I can call on whenever I’m feeling sore… I do not. So this did the trick. The only tip I have is to only use it if you have the time to really work out the knots, otherwise you end up with half worked out knots which can actually do more damage than good (just my personal, non professional opinion of course). Other than these five products, my biggest tip for surviving the first trimester is to take care of yourself as best as you are able. With my first two pregnancies I either had to, or felt like I had to push through all of the symptoms. This time around I gave myself permission to do what was necessary to feel better. I find that sleep is the number one way to lessen morning sickness. As in: if you are tired, you are more likely to get nauseous. This was 100% true for me. I felt a lot better when I was getting 12 hours of sleep at night. Naps weren’t a possibility for me as my oldest doesn’t nap anymore so I really tried to prioritize my night time sleep. This meant that the house didn’t get cleaned for months, dishes weren’t cleaned right away, and David got to deal with any night time wakings from the girls. Thankfully David was willing to pitch in as much as possible. I know not everyone has a great support system, but I would urge you to just do the best you can to give your body the rest it needs. Also: water is a big factor in feeling better. This is a hard one for me because, in addition to my intense food aversions, I also could barely handle the taste of water. So I kind of just forced myself to do it, and drank when my body was best able to handle it because it really did make me feel a lot better. Pregnancy is not a time to feel like you have to do it all… it’s a nine month period of your life where you are creating a baby. That’s amazing! And your body deserves to be treated with care. I think that’s everything I wanted to say! For those of you who are/have been pregnant how did you survive the first trimester? Let us know in the comments so we can all benefit! Thank you for this! 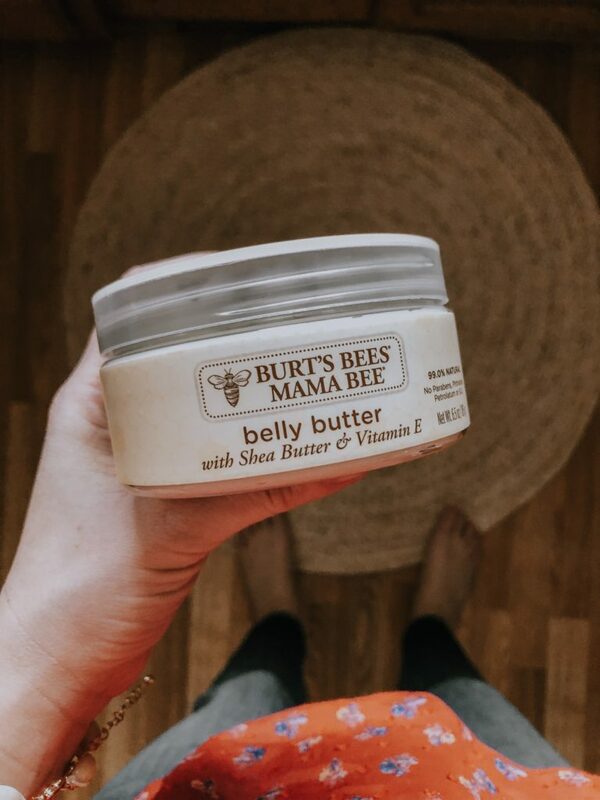 I am definitely going to try the body butter because my belly gets so itchy as well! And yes to water making everything better! I often forget to stay hydrated this time around which I think is partly due to caring for my 2 year old diva (lol). And I knew I wasn’t getting the greatest pre natals the first time around. Just didn’t trust what was in them. This time my midwives prescribed this really awesome prenatal called Vitafol Ultra which contains better ingredients including folate versus folic acid. I never knew but many women can’t ansorb folic acid because it is a lab created chemical while folate comes from natural sources! Either way I haven’t been getting leg cramps this time around and have had lots of energy in the third trimester. Maybe if I had known more of this the first wouldn’t have been so rough. It was debilitating fatigue and this really awful depression that basically rendered me useless. Very interesting how pregnancies differ!